Located in the rolling hills on the northeast corner of Escondido, the Daley Ranch is home to a variety of plant and animal species, including over 100 species of birds. Several diverse habitat communities dominate the preserve. 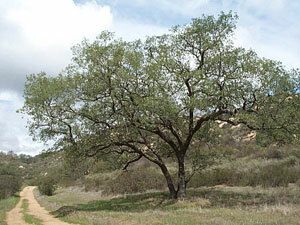 Engelmann oak and coast live oak woodlands are utilized by over 300 species of animals in California. Many species of birds, including raptors (birds of prey), can be seen in their branches. Widespread development has greatly reduced the number of oak woodlands. Engelmann oak woodlands, once relatively widespread and abundant, are now one of the most endangered natural communities in California. Diegan coastal sage scrub is another threatened habitat found in several areas around the Ranch. A number of rare animal species, including the San Diego horned lizard and the California gnatcatcher, live in this type of habitat. Chaparral is the most prominent vegetation community in this area. Like the Diegan coastal sage scrub community, the plants of this habitat are well adapted to summer drought. The most common plants of this community are chamise, mission manzanita, scrub oak, black sage, and ceanothus. Rock outcrops along the western ridges of the property are also an important habitat. They provide homes for a variety of reptiles, including the southern Pacific, red diamond, and speckled rattlesnakes. Various raptors use these outcrops as nesting and perching sites. The outcrops provide denning sites for larger predators such as the coyote, bobcat, and ringtail. Mountain lions have also been seen among the rocks on occasion. Three year-round ponds, several seasonal ponds, and a seasonal creek provide an important source of water for the area wildlife. Many aquatic birds, including ducks, cranes, white pelicans, coots, and osprey can be seen on or around the ponds.